My best friend, Rachel, got married over this past weekend. I had the honor of being her Matron/Maid of Honor for this extremely wonderful occasion. Rachel asked me to give a speech/toast for the wedding and I happily obliged. I spent a few months thinking about the content, on and off. When I sat down to write it, I did it in one pass, with a few edits to tweak it during the week leading up to the wedding. When it came time to give the speech, I had to follow several other people and I was nervous. I was also full of emotion for my friend; so happy to have reach this day; elated to bear witness to their union; proud of my friend for making life changes that brought her to this day. I share this speech with the world, as it was such a hit! I wish I could have the audio delivery of it - that seemed to have made the biggest impact. 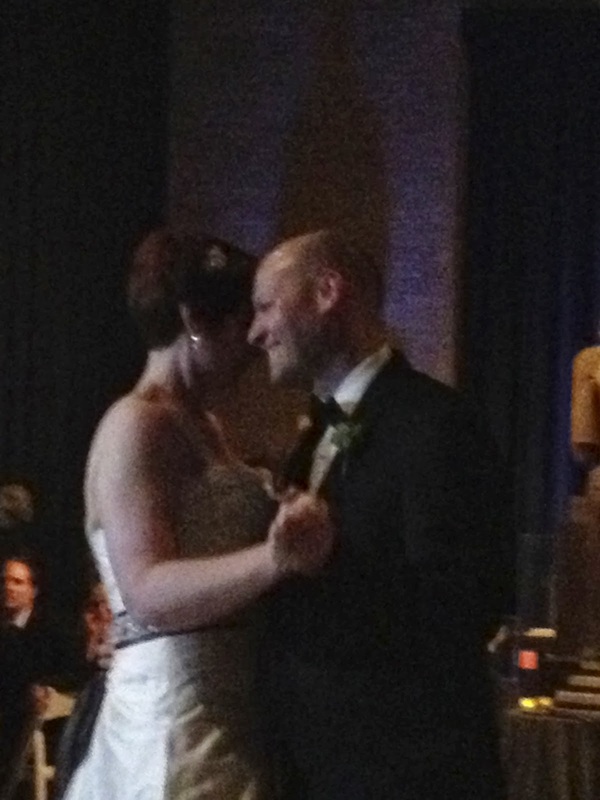 I'm sure I'll post other photos and remarks about the wedding, but having the speech available was important to me. Mazel Tov! Rachel & Jim! May you both move forward into your knew life together and know a long life of happiness and love. Good evening ladies, gentleman, friends and family. Thank you all for being here in honor of Rachel and Jim. My name is Denine Gorniak and I am Rachel’s Bride’s Maid/Matron of Honor. I’ve known Rachel for over 27 years. We met when we were 18 yrs old, students living in the dorms at Temple University, Ambler Campus, in the fall of 1985. The two of us were sort of outsiders, living in a dormitory of noisy, girly girls. Fate, cemeteries and a poster of a Frenchman carrying a baguette while riding a bike brought us together. Music, Movies and M&M’s sealed our friendship. Later we would add travel, cats – so many cats! and baseball to our lives. Over past 27 of our friendship, we’ve been like sisters and parents to each other. Sometimes we’ve even been like an old bickering couple. Rachel has seen me though countless dates, hair colours & hairstyles (remember the Mullet - which I called the Gloria Estefan?) - and several triumphs and tragedies of our beloved and this season, beleaguered Phillies. She is my son’s “fairy godmother”; my trusted confidant; She is Grace to my Will; and my best friend. I always wished that Rachel would meet a wonderful man, who would see all the loveliness and sweetness that I see and know in her. Still waters run very deep and within Rachel is a well of the deepest thoughts and dreams. I knew that the man who would be adept at divining would be the one to find this wellspring within her. You, Jim, are that man. When Rachel told me that she had a date with you, she said that she was smiling at your photo and at the thought of meeting you in person. I knew, at that moment, you were the person for Rachel. Sure enough, she was smiling and giddy when she called to tell me all about your lovely 1st date at Beyond Bread Even though we were nearly 1,000 miles apart and a 3 hr time difference, I knew in my heart you and Rachel were fated to be together. After hearing about your trip to San Diego and then when you came to Phila to meet her crazy East Coast Contingency of friends and family, I knew you were a keeper. We met you and fell for you just as hard as Rachel did. At a Phillies game we all attended, I surreptitiously took photos of the two of you, holding hands, knowing then that I’d have them for this day to share. I could see the love between the two of you. I could see how perfectly in synch you were. I could also see that you were the right man for whom she had patiently waited. As we celebrate this marriage, I want to read to you these words of relationship wisdom I asked several of my friends who have long-term, loving marriages and relationships to share with you. Relationships are work, but they don’t have to be hard work. It may not always be easy, but nothing worth having is. Laugh often and tell each other you love one another, every day. And now, may we all raise our glasses and toast the couple - Rachel and Jim!